Emergencies will never knock on your doorstep before coming in and taking over everything. What if you wake up early in the morning and find out your kitchen pipes are frozen. What will you do? Well don’t you worry, give us one call and we will get you covered with our expert plumbers. Here in Pompa Plumbing North Hollywood we are always ready to provide you with expert services, no matter the time or weather. Your plumbing emergency is all that matters to us. And we charge on a fixed rate, that depends on the type of problem you’ve got. No overcharging according to the weather or the time of day. So, if you want your frozen pipes fixed, at an affordable price, just contact us here, at the Pompa Plumbing North Hollywood. What kind of problems you would face with frozen pipes? The cold winter days are coming. And they will bring problems like frozen pipes with them. Suppose you woke up early morning to find out your pipes are frozen. The volume of water expands and can burst your pipes. 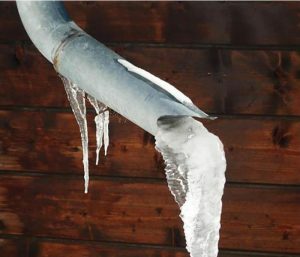 When the actual water in the pipe freezes, the pressure between the cold faucet and the blockage can build up a point that may cause the pipe explosion. Frozen pipes are unable to run water thoroughly. Well that is obvious. And that could interfere your ability to do your everyday tasks. Such as washing the dishes or taking a bath. In each aspect frozen pipes are a nightmare you want to avoid. Always. When to call us at the Pompa Plumbing North Hollywood? You should keep an eye on your pipes, always. Specially at the winter season. You can contact us for regular cleanings or maintenance. But if you observe any of these signs, you’ll know that your pipes are frozen. These are emergencies and you need to make decisions fast. Our experts can deal with this kind of emergencies immediately and with excellent ease. We use advanced technologies and latest tools, and we own a great team that can help you with this kind of emergencies. We can unfreeze your pipes without weakening them. And we do that in a safe environment friendly way. Our experts here, at the Pompa Plumbing North Hollywood are always there to help you with these kinds of problems. Our experts will seal any visible openings, and then check drafts. We will use insulation to block any draft or cold areas. We will open the cabinets and circulate temperature to the pipes. We use latest technologies such as installing heat tapes on all pipes which are exposed to frigid air. We will replace your frozen pipes as soon as possible if needed. Moreover, we will make sure that your pipes will not burst and cause more damage. Frozen pipes are nightmares. Yes, we know that but that is why we are here. The actual water that’s been frozen inside the pipes, expand in volume, and causes burst pipes. Your water supplies will be interrupted. You daily household works may stop. Frozen pipes are dangerous because they can cause damage to your ceiling, wood floors etc. Some technicians of us has experienced house floods caused by frozen pipes. Only our well experienced plumber can provide you a great service. Only our plumbers can allow water to thaw and re-establish the water flow in minutes.